There can be no denying that I am a fan of Michael Kors. Walking into a department store and seeing the wonderful new collection I am always hit with a wave of pleasure. Especially when there is a sale. Whilst I have liked Ted Baker for a while I had yet to buy anything in terms of bags. Much like Michael Kors there was a sale generating throughout the Ted Baker section. 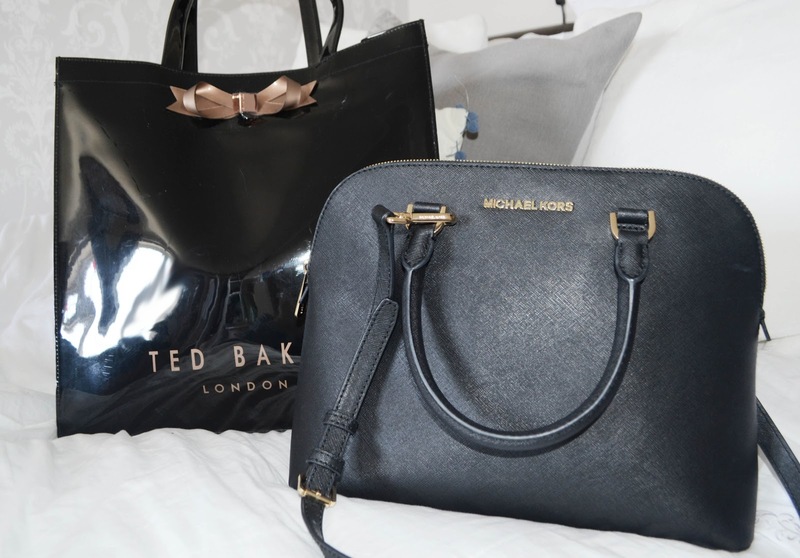 I love the look of the Ted Baker shopper bags and they were currently on offer for ￡19.00, it is the perfect size for university, carrying my laptop and books backwards and forwards. I also purchased a Ted Baker make up bag from Boots during the Christmas gift sale in January. I absolutely love the make up bag, the floral design and the rose gold accents make it stunning. Half price at only ￡4.00 it was definitely going into my basket. Finally, and my favourite item, I purchased my Black Michael Kors Cindy Dome bag. I think this is my favourite Michaela Kors bag I have purchased. Black is a classic colour and will stand the test of time. Another bargain price in the sale I make sure that I only ever purchase this brand when there is an offer.